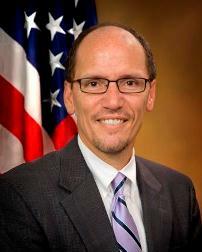 A group of 139 House Democrats are urging the quick confirmation of Labor Secretary Nominee Thomas Perez. The letter to Senate leadership lauded Perez’s “distinguished record of accomplishments and experience from his career in public service at the local, state and federal levels. “Known by those who have worked with him for his consensus-building, collaborative approach to problem-solving, Mr. Perez would bring vigor to his new post that will serve the American economy well, by helping improve the skills of American workers to qualify for better-paying jobs and providing employers with a stronger workforce able to compete in the global market,” the letter stated. Under his leadership as Assistant Attorney General for Civil Rights at the Justice Department, Perez’s division has increased prosecutions of human trafficking by 40 percent, convicted 74 percent more defendants on hate crime charges and handled more new voting cases in 2012 than any year prior. He previously served as Maryland’s Labor Secretary, where he worked to reform the state’s enforcement of state and federal wage protection laws. He has earned the endorsement of the Maryland Chamber of Commerce and many labor unions, including the IAM. The Senate Health, Education, Labor and Pensions (HELP) Committee voted last week to clear the nomination of Perez to a vote on the Senate floor. But multiple media outlets report Senate Republicans plan to use procedural tactics to delay or block a full Senate vote. President Obama nominated Perez for the post on March 18. Click here to view the full letter from House Democrats. Click here to view a statement from Sen. Tom Harkin (D-IA), Chairman of the Senate HELP Committee.